PWAs get high in Tagaytay! 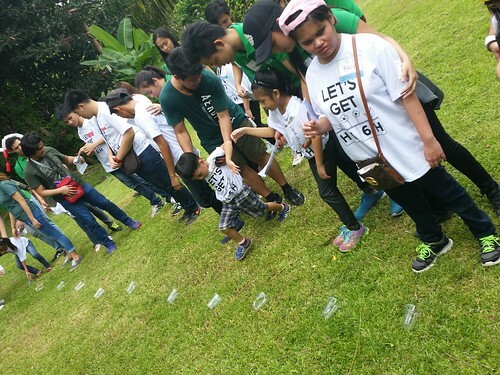 Tagaytay Highlands celebrated their “Let's Get High Year 6” event last 22 October 2016 and we were very blessed to have been invited. Tagaytay Highlands partnered with some organizations like COSCA and LOVE which are volunteer organizations from De La Salle University. ASP is a beneficiary of this year’s event, along with DSAPI, PCWHIC and PAVIC. It was our first-time to go to Tagaytay Highlands since it is exclusive to its members only. The view was very breathtaking and the place was really scenic. In fact, Elysse, my 7 year-old daughter, took some pictures as we wind down the road. The great weather was also a welcome respite after two consecutive typhoons. We arrived at the Holy Family Chapel to register and we were greeted by genuine smiles from the volunteers. Elysse was really looking forward to picking some vegetables. I made it a point to tell her where we were going and the activities that they will be doing. Enzo, my 4 year-old son, on the other hand, enjoyed playing football with Kuya Paolo, one of the volunteers from COSCA. After the mass, the kuya's and the ate's were assigned to their kids and then proceeded to the assigned activities. For our group we were set to do tree planting first and then vegetable picking and lastly trip to the zoo. I thought that Elysse and Enzo would be disgusted by the soil but surprisingly they loved putting soil to cover the planted tree. Enzo loved to use the shovel which was taller than him. After planting, a short relay game was played and the children were very eager to win. Next we headed to the next site to pick vegetables listed on their adventure booklet. Elysse was able to get a green chili and an eggplant. Enzo, however, saw the swing and played there with Kuya Timy. The vegetables were then weighed and were collected to be cooked for lunch. Last activity on our list was the visit to the zoo. The kids were able to see turtles, llamas, gorilla, goats, snakes birds, alligator, fawns, wild boars monkeys etc. It was a rather fast trip since Elysse and Enzo were a little scared to go near the animals. It was lunch time so we headed back to the Bistro for lunch. After lunch there were presentations from participants and volunteers. The kids were given loot bags full of treats and to end the day’s activity we headed to the pool area for a group picture. It was a fun filled day and despite the heat and the exhaustion everyone sure did enjoy. It’s really heart-warming to see kids with special needs enjoy these activities. They did not let their disability hinder them from having fun and just feel they can do anything. I really wish more of this kind of event will be done for special kids because this is a different and special experience for them. About the contributor: Elvie dela Fuente is a mother to two children on the spectrum -- Elysse and Enzo.